The natural-color image of the galaxies was taken with NASA's Hubble Space Telescope and with the Canada-France-Hawaii Telescope in Hawaii. 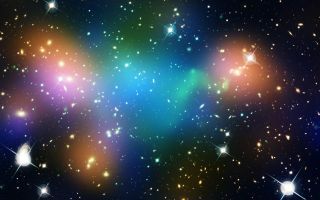 This stunning space wallpaper reveals the distribution of dark matter, galaxies, and hot gas in the core of the merging galaxy cluster Abell 520, formed from a violent collision of massive galaxy clusters. The natural-color image of the galaxies was taken with NASA's Hubble Space Telescope and with the Canada-France-Hawaii Telescope in Hawaii. Superimposed on the image are "false-colored" maps showing the concentration of starlight, hot gas, and dark matter in the cluster.